With its varied terrain, P-H Farms Boar Hunting Ranch is a wildlife paradise for many different species. 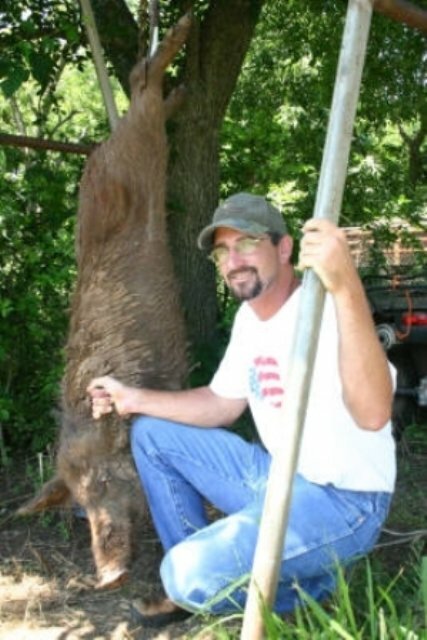 For some of the finest wild boar hunting in Oklahoma, spend time hunting on the gently rolling hills, oak ridges, pecan trees, cedar draws, persimmon thickets, agricultural fields, creeks and ponds. Besides wild boars, this guide service also leads Rio Grande turkey hunts, a limited number of whitetail deer hunts, guided fishing trips for hybrid, striped and sand bass, and hunting leases. Simply grab a bow and arrow, rifle, black powder or pistol year round and hunt down some hogs without needing a license. After hunting, rest up at the ranch, set up to accommodate up to 10 hunters at a time inside two rustic log cabins. The cabins are set along the side of a 5-acre pond and consist of a private room with queen sized bed, a room with two twin beds, a bathroom, kitchen and living room. Relax with a seat on the rustic log furniture, and grant another visitor a place to sleep with the living room futon. Larger parties will enjoy the bunkhouse, which includes eight beds, a living room with card table, couch, satellite TV, a DVD player, a full kitchen with refrigerator, oven and stove, microwave, coffee maker, kitchen sink and table. A full bathroom, and separate room consisting of two beds and a lockable door for privacy, complete the bunkhouse.